BC is a leading provider of SQL Server Remote DBA support with complete SQL Server monitoring and production support. 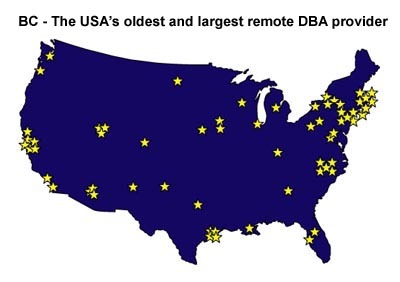 BC has the most comprehensive SQL Server Remote Monitoring Alerts in the industry, and BC is the USA's oldest and largest Remote DBA provider. We also offer SQL Server Health Checks to ensure that your SQL database is performing at peak levels. Don't trust your mission-critical SQL Server database to a beginner. BC SQL experts can install and implement a full suite of predictive software to alert us before your end-users experience a loss of service. All clients must provide secure external access to their SQL Server database servers, either via dedicated dial-in or secure connections over the Internet. The client must agree to allow BC to pre-approve all production SQL Server database changes. This includes changes to the server environment including all files and directories owned by SQL Server. Our remote SQL Server service provides 100% of the remote SQL Server database administration needs for your company, and includes 24x7 access to our staff of SQL Server support experts. Four hours of free Remote DBA support every month. You can use these free hours for any Remote DBA activity, including database analysis, system design, production migrations or personal mentoring. All this, for only $1,400/month per SQL Server database. BC provides complete SQL Server Disaster Recovery support and implementation to guarantee high avauilability. Mirroring: Database mirroring in SQL Server 2008 mirrors the transfer of transaction log updates directly from one server to another and can quickly failover to the standby server. Windows clusters: Windows Failover clustering uses the Windows OS and MS-SQL to provide hardware redundancy in case of a server failure. If a Windows server becomes unavailable (blue screen of death, Windows hanging), clustering to resurrect the SQL Server database on a new server with has the footprint for the SQL server software, automatically mounting the MSSQL database files. Log Shipping: Backup log shipping copies the transaction logs to a remote server where they are applied to a copy of the production database that was created from a cold backup. In the highly likely event of a Windows server failure, MS-SQL can redirect transactions to the standby server, which swaps out as the new production server. Third party replication: Tools such as Goldengate can write updates simultaneously to two SQL Server databases. Leverage your investment! BC offers discounts for clients who have substantially similar SQL Server databases in multiple environments. An example of this would be a SQL database with multiple copies in a test, development, QA and production n environment. In addition to our Remote DBA support packages, BC also offers complete Remote DBA services, billed on an hourly basis, so you only pay for what you need. These services include virtually every SQL Server task. Does your boss blame you for a performance problem? Do you need to certify that your database is optimized?